year, he decided to resign his post to make way for his successor. young people in Japanese cotton industries. “Why Cotton?” for professional and supervised “Cotton Video Series”. 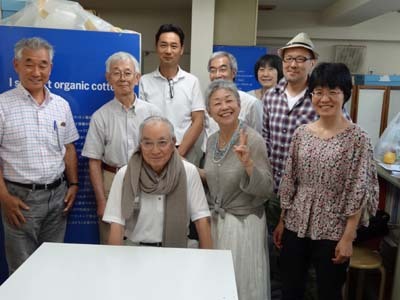 Japan Organic Cotton Association which was reorganized in the same year. International Working Group on Global Organic Textile Standard. Japan Hyogo as Vice Chairman. 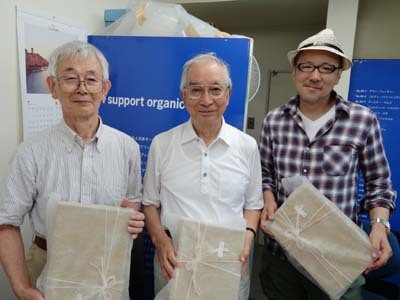 The photo is retired three with each memento, from left side Norifumi Makuuchi (director to advisor), Akira Hibi (president to director) and Hiroyasu Kume (director to advisor). In the photo, center in front row is Akira Hibi with memento, special muffler, right to next Chieko Watanabe vice-president JOCA, right end is Mutsumi Sakuyoshi advisor, center in back row is Akira Kimura, new director from last year, left end is Kazuhiko Mori new president.